Reception games are a fun way to relax after the anxious buildup of the wedding ceremony. A few game examples get you started so guests and the wedding party can interact and enjoy the reception together. Many people believe that wedding receptions are rigid affairs that can only include dinner, a little dancing, and polite conversation. However, there's no hard and fast rule that says you can't mix it up a little with some wedding reception games and activities. Your guests are there to celebrate your day. However, they also want to feel comfortable at the event. This can be difficult in a room full of people they don't know. Games are a great way to break the ice and help your guests get to know one another. It's also a fun way to interact with your beloved family and friends. Trivia Games: Trivia games are a fun way to engage the intellectual side of your guests. There are many trivia subjects that can work for a wedding, from personal information about the bride and groom to general topics about the city, about pop culture, and any number of other things. Scavenger Hunt: A scavenger hunt is a great way to get guests to interact with one another and can work as an excellent icebreaker. Break guests up into teams. Team members must work together to solve a clue, which reveals the following clue until the end and a winning team is revealed. Card Games: For a more casual take on wedding reception games, leave a deck of cards on each reception table to allow guests to play whatever card games they wish. A personalized deck of cards also makes a fantastic wedding favor.. Puzzles: Another great way to entertain guests is to leave puzzles on each reception table. This could be a jigsaw puzzle or combination puzzles. This can keep adults and children alike entertained while the wedding party is getting photographs and making their way to the reception hall. Paper puzzles (such as crosswords) math puzzles, and word searches are also great ways to entertain guests. 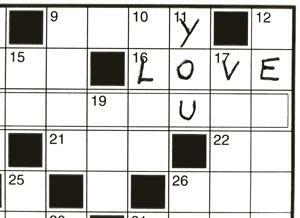 You can make your own crossword or word search online for a personalized touch. Mad Libs: These word exercises are a fun way to engage a group of guests. Simply ask players to submit verbs, adjectives, nouns, and so on and then read them the "mad lib." This is a great way to get guests laughing and working together. Adults aren't the only guests that need to be entertained. Many people include children in the wedding reception. By hosting a few kids' party games, these important kids can feel like a bigger part of your special day. There are many ways to incorporate games into your wedding reception. By straying from the typical wedding dancing and other entertainment, you can create new traditions and involve all of your guests.